This year has flown by so quickly! 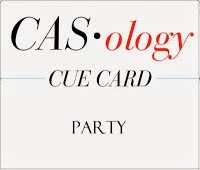 I made over 180 cards and five 21st albums this year! I was also very lucky to have 6 cards published this year in American magazines. I aim to try for Australian publications next year! Here are my top ten twelve cards for the year, enjoy! 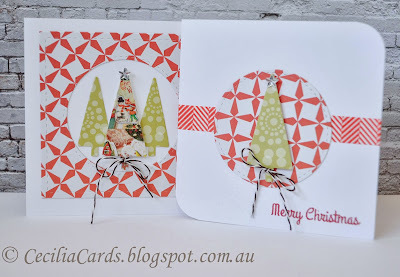 I made a couple cards yesterday when I was baking my pavlova! The last two Christmas cards are for my family. 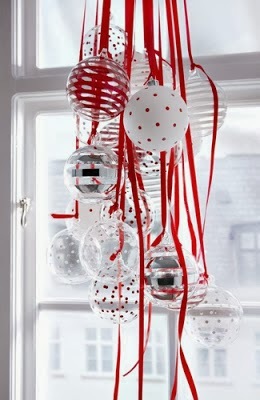 We usually celebrate together on Christmas Eve. My brother arrived from Oman yesterday morning, he was as sick as a dog and ended up in bed all night! Oh well, more food for the rest of us! 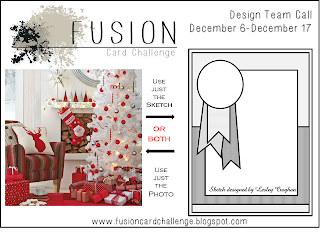 I'm adding this card to Retro Sketch #95, Basic Grey Challenge #110 - Anything Goes and Paper Crafts December Gallery - Holidays! 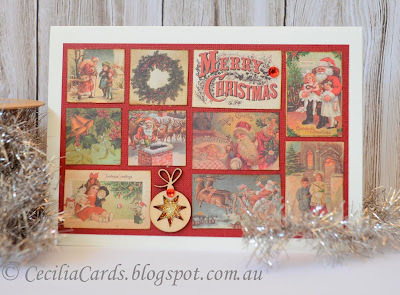 Wishing all my blogging friends a very Merry Christmas and May we make more cards in 2014!! 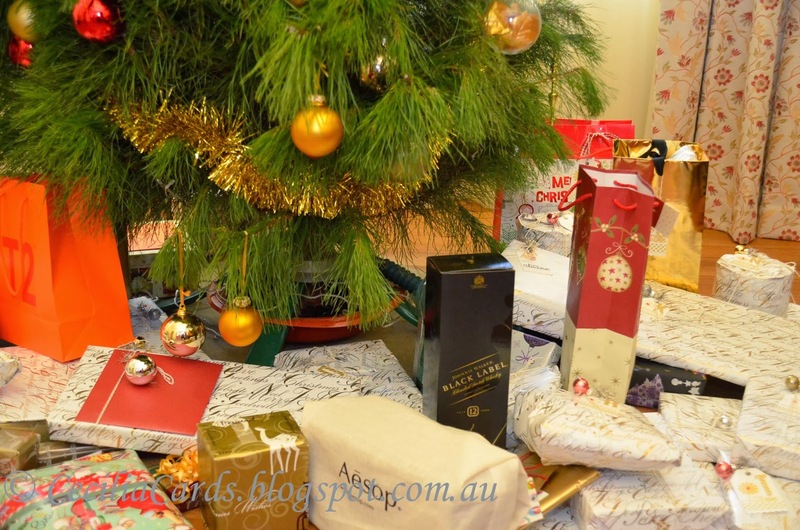 I've got some photos to share from our Christmas celebrations too! Lots of presents under our Christmas tree! 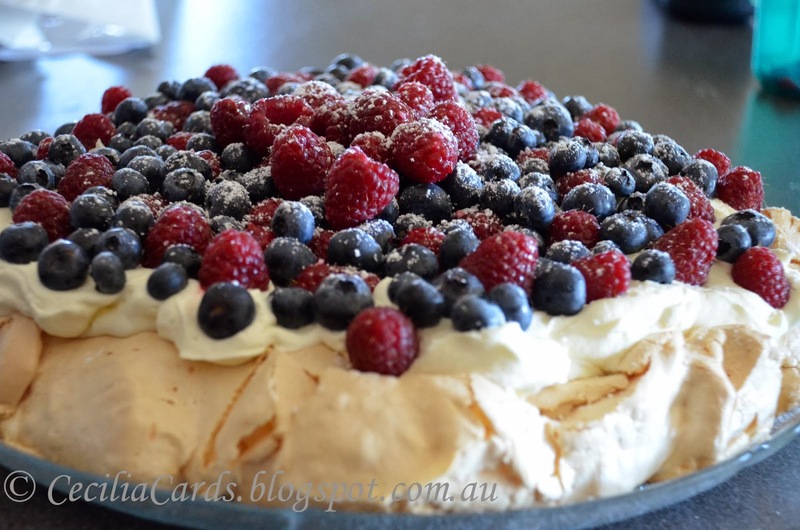 My pavlova for Christmas eve! 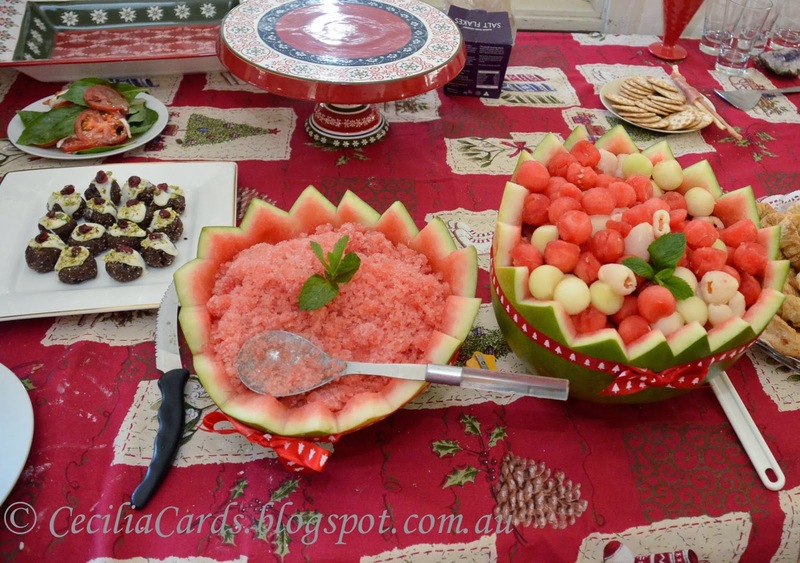 My desserts on Christmas day - Chocolate fudge puddings, Watermelon ice and salad. 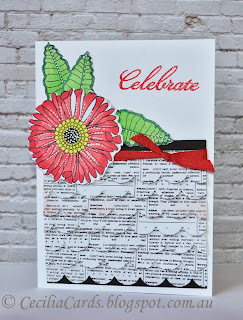 Neenah Solar White, Basic Grey 25th and Pine, Hero Arts CL634, Versamark, White EP, Hemp from Hemtique, Lil Inkers Stitched Squares and Circles Dies. Presents are all wrapped and under the tree! The house is a mess, I've got a pavlova to make and a seafood platter to assemble for my family dinner at my sister's house tonight. My brother has just arrived this morning from Oman and he is on the way to my Mum's. 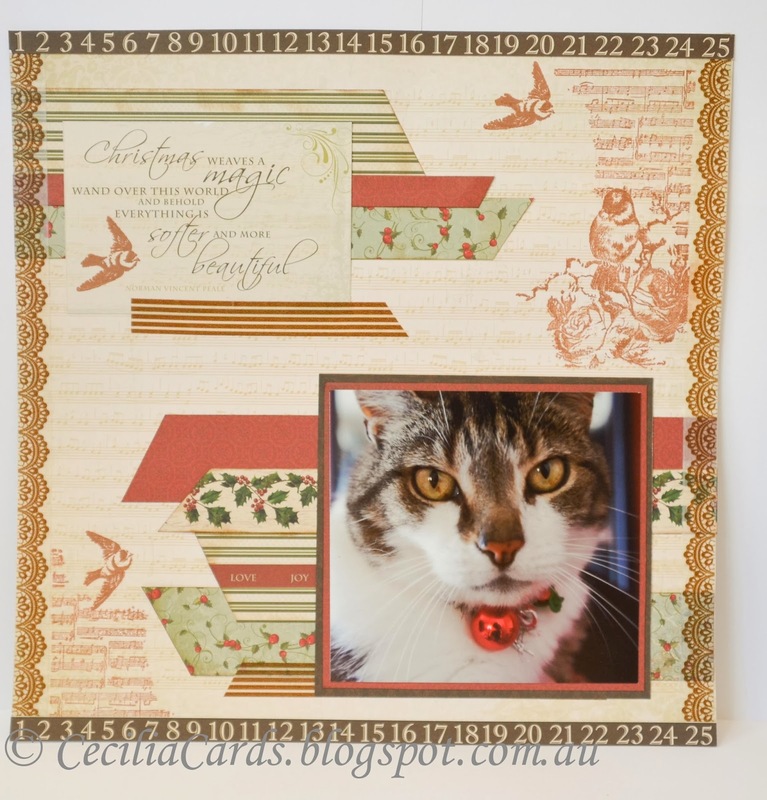 Here is a layout (I don't do many scrapbook projects as I'm not very good at them) that I made from a photo taken last Christmas of our cat Tiger. 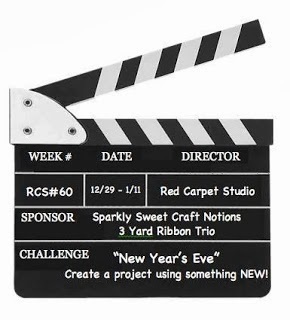 Come back tomorrow and I will show some photos of what I'm making today! 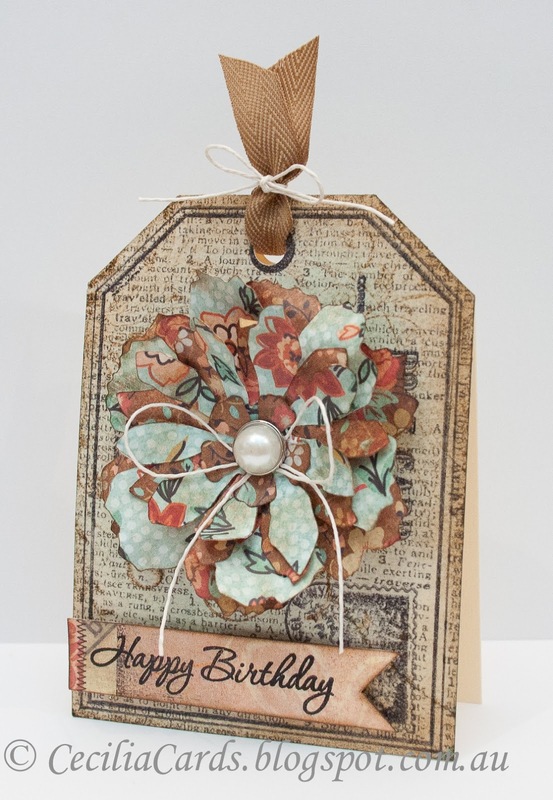 Kaisercraft St Nicholas 12x12, Porcelain Rose Stamp and washi tape, Ranger Archival Coffee and Tim Holtz Gathered Twigs. 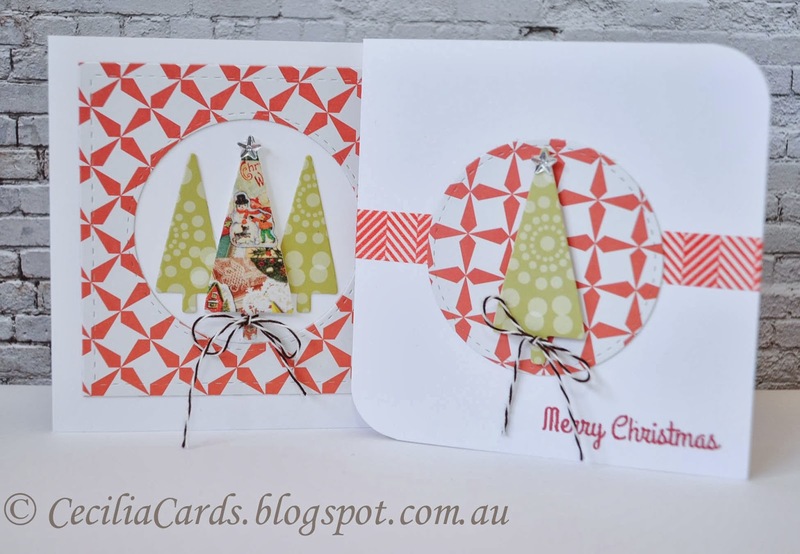 … and I'm still wrapping the last few presents.. and making a couple of last minute cards. 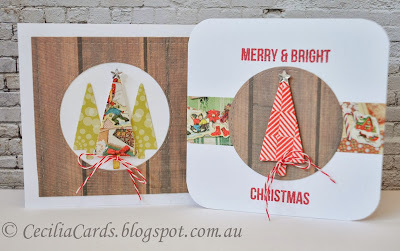 I got this Christmas tree die from the Australian Simply Cards magazine and have not had a chance to use it. 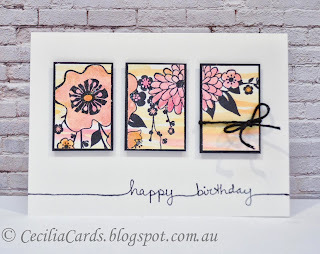 I saw a video on Jennifer Mcguire's blog about getting a faux letter press effect on water colour paper. 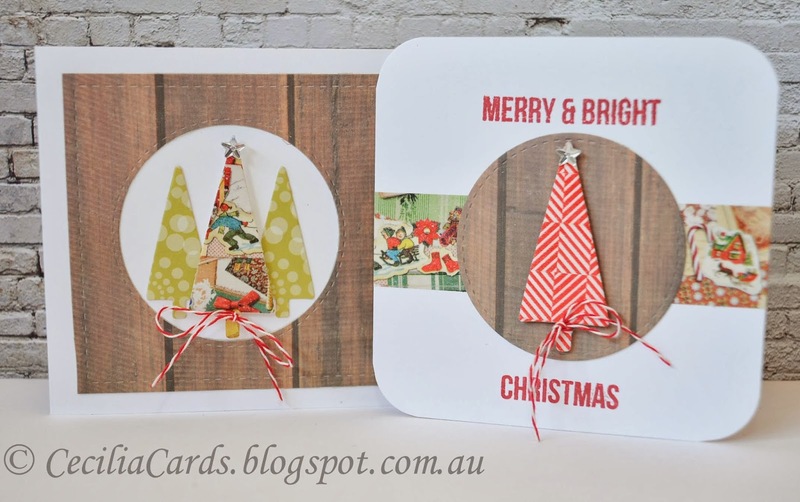 I decided to try it and it was so easy, I decided to make two cards while I had everything out. By the way, when I see an interesting technique blog post or video, I add it to my Tutorial Links page, I find these handy when I want to try out a different technique. The colours I have used are for the current ColourQ challenge #220. 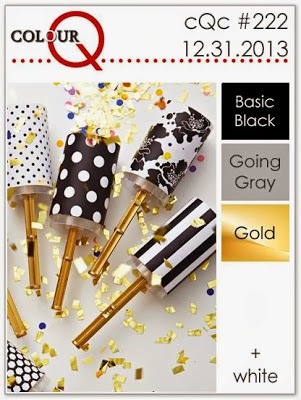 I'm also adding this to Basic Grey Challenge 110 - Anything Goes. 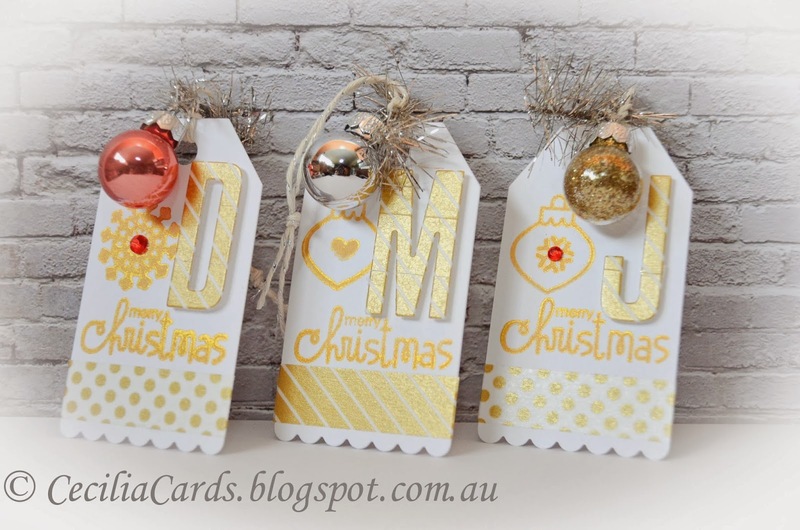 Neenah Solar White, Paper Smooches Merry Motifs, Delicata Gold ink, MT Tape, Paper Smooches Die, MFT DieNamics Tall Alphabet Dies, Kaisercraft rhinestones, Baubles from Typo, tinsel from Morgan & Finch, wrapping paper from Wrapco.com.au and twine from The Twinery. It was nice to finish up at work yesterday with a work staff Christmas function. We had drinks and pizza at a restaurant near work and it was well attended. Well, I don't know what happened today, but I feel very tired and there is just so much for me to do and I can't get started on anything. So, I turned to my Craft Room and started making some cards. 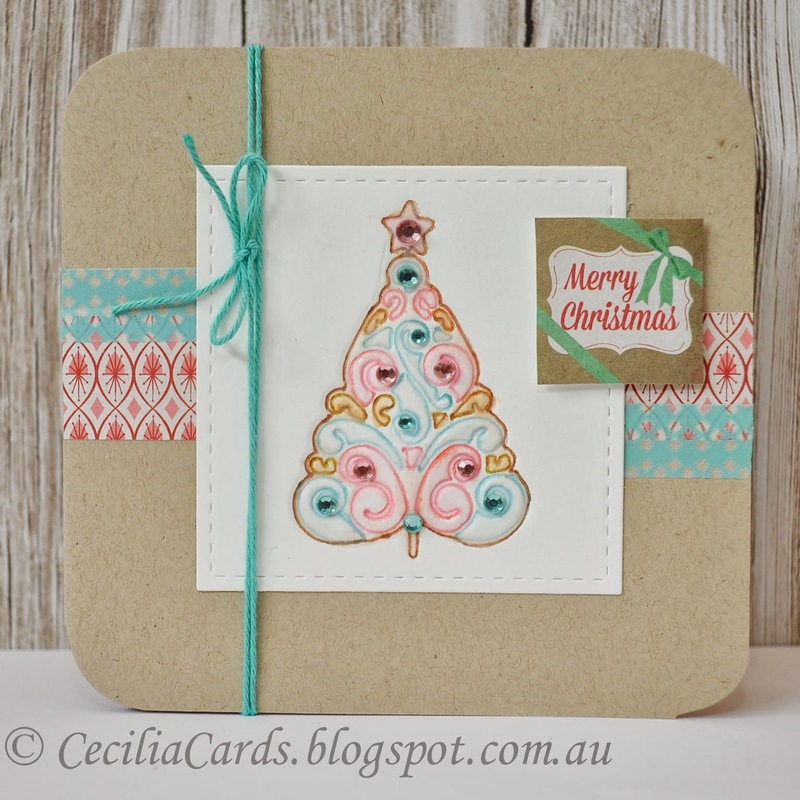 This one uses a stamp set I bought at the end of Christmas last year and it has not been used. 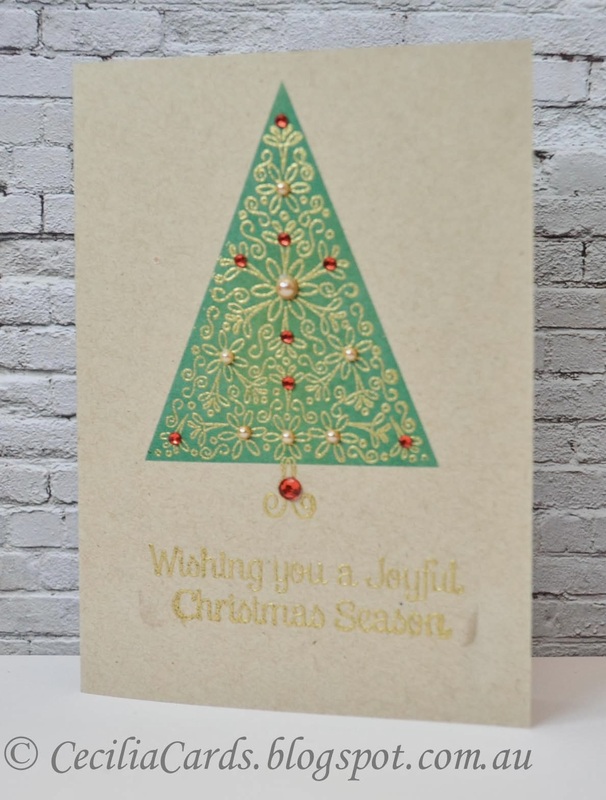 I gold embossed the image and then masked off a triangle to ink the tree in. 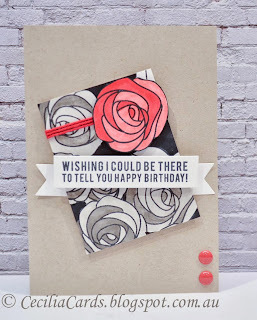 Quick last minute cards are just what we need right now! 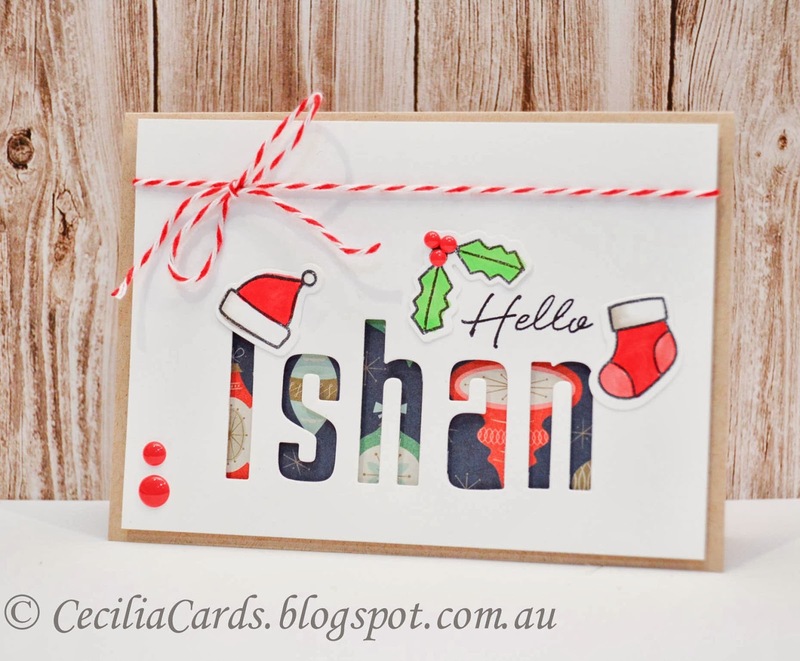 Neenah Desert Storm, Hero Arts CG397 Joyful Christmas Season, Versamark, Gold EP, Distress Inks Evergreen Bough and Bundled Sage, Kaisercraft pearls and rhinestones. …. and a baby was born… This card is for a work friend who delivered a baby boy yesterday! 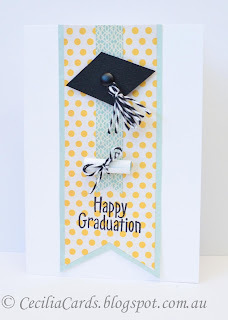 Congratulations Anu! 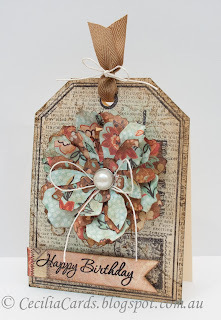 I'm adding this to Paper Smooches Sparks Challenge - Anything Goes and Basicgrey Challenge 110 - Anything Goes. 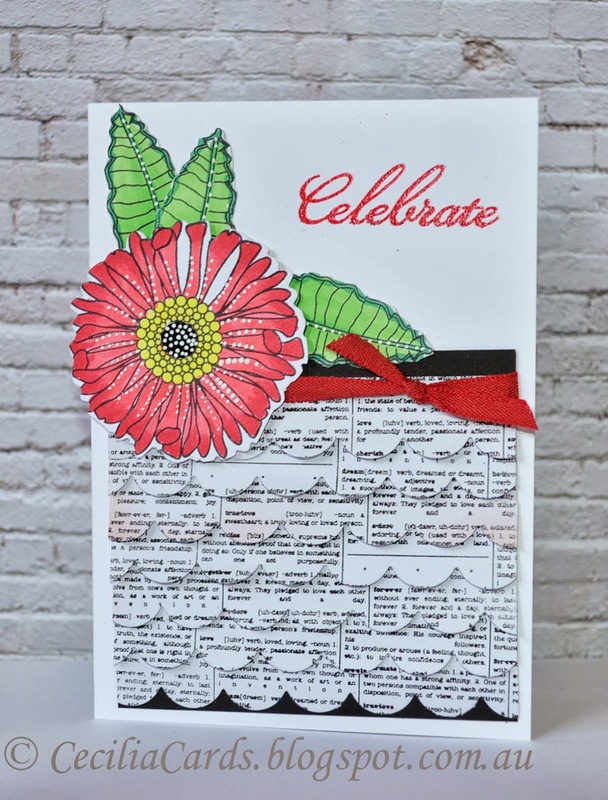 Neenah cardstock, Basic Grey 25th and Pine, MFT DieNamics Alphabets, Paper Smooches Motifs, Hero Arts Just Saying, Copics, BG enamel dot and twine from The Twinery. The night before, I stayed up late to finish off 40 place cards for a work Christmas function and presents for work friends. It was worth it, as I got them all done and they were all given out yesterday. 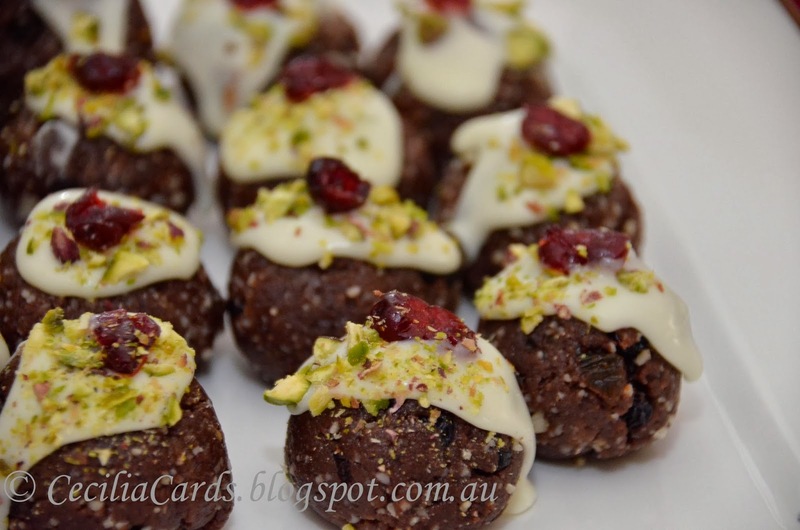 I like to share the little bags of chocolates I made up. As I work in the laboratory, I got a test tube of jelly beans from Happy Lab for each bag. I thought it was most appropriate! I also made reindeer tag cards for the bags. Thanks for dropping by! 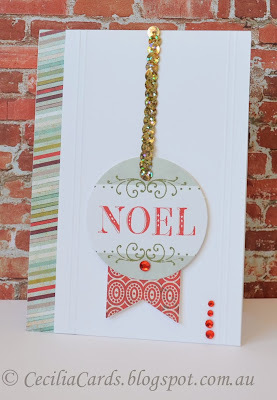 Neenah Desert Storm, PTI Tag die, Hero Arts Holiday Cheer, Ranger Archival Jet Black, Kaisercraft rhinestones, twine from Kikki K, tinsel and baubles. I'm feeling a little more organised now, due to two late nights to get everything done! 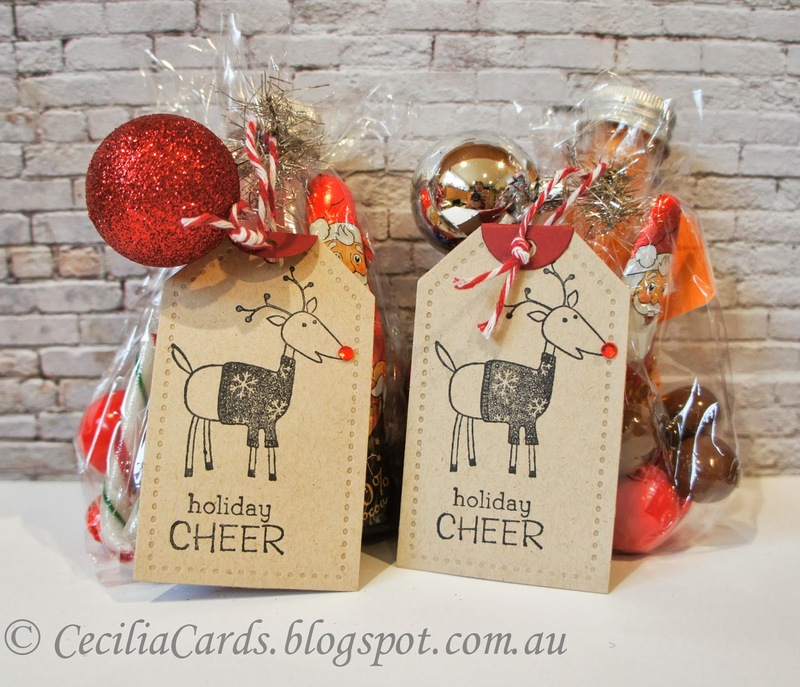 I finished off 40 place cards for a Christmas work function with a nautical theme last night as well us finished off all the Christmas wrappings and cards for workmates. 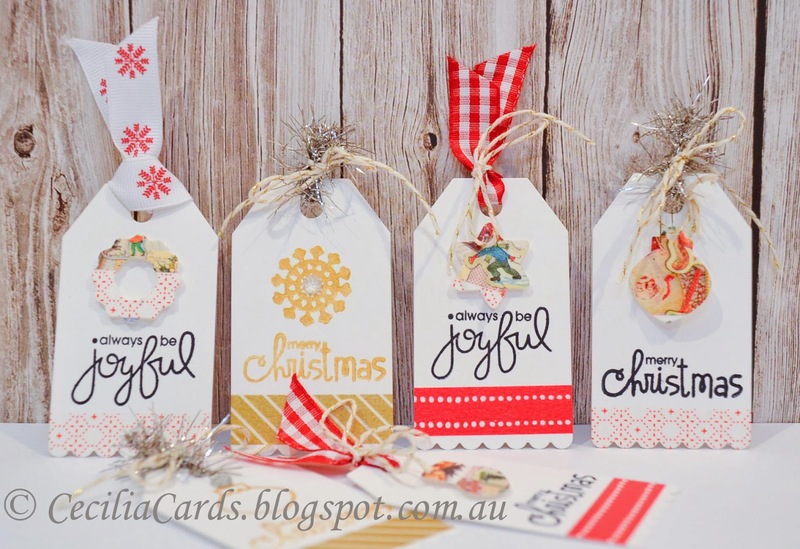 They all got handmade cards or tags! What an effort to get them all done! 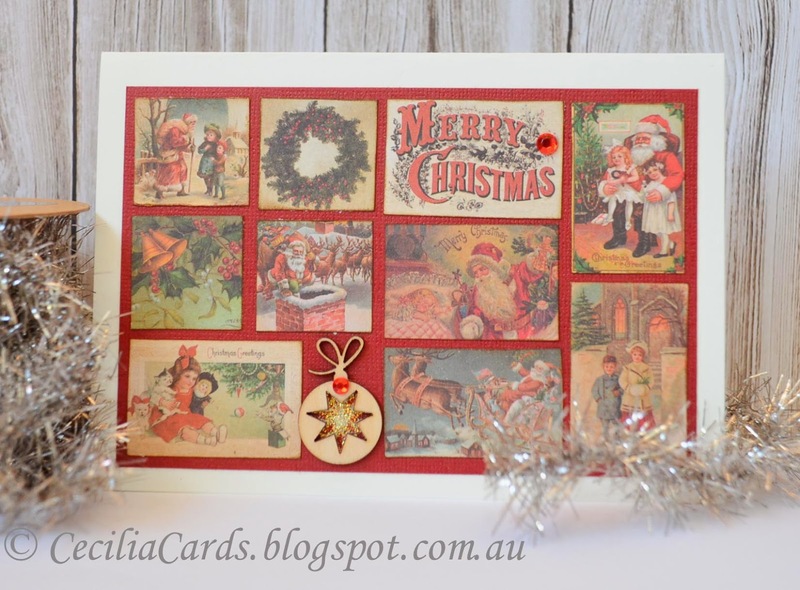 Here is a card I made a while ago, this is already on its way with Australia Post to one of my friends! Thanks for dropping by! 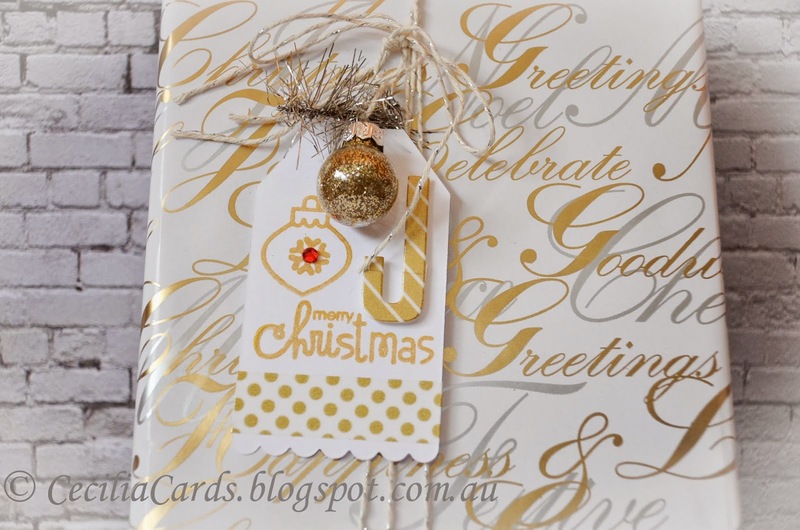 I still have more Christmas wrapping to finish off by the weekend, maybe I will relax for a couple of days before Christmas! I've got Monday and Tuesday off! Neenah Natural white and red card stock, Kaisercraft December 25th 6x6 patterned paper, bauble and rhinestones. Whenever I still a trigger photo or a sketch, I usually have an idea of how I want to do it. 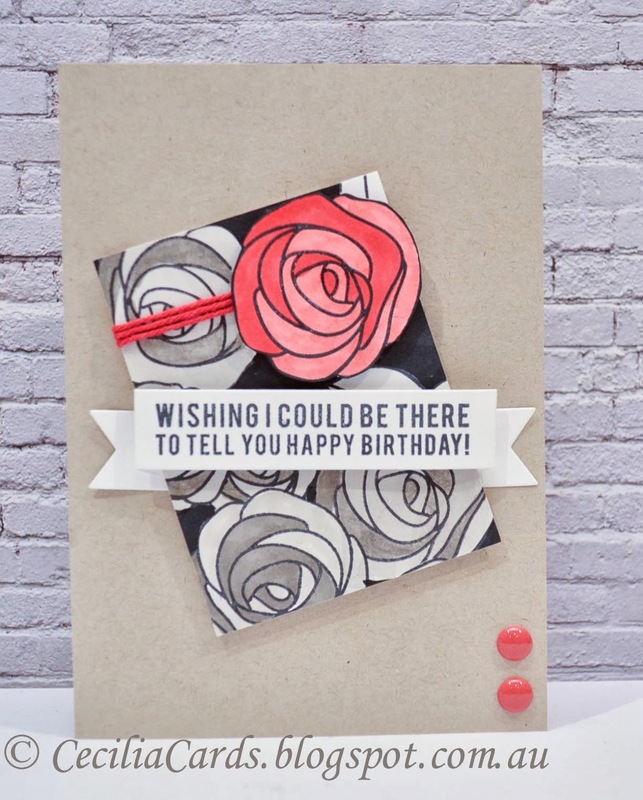 Sometimes, by the time I get to making the card, I go off on a different tangent…. 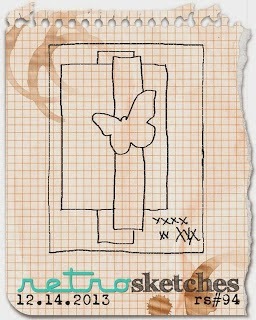 This is what happened to this card. My original idea of using Perfect Pearls for snowflakes… it didn't turned out too great… so then I tried embossing with silver on brown… not too nice either! 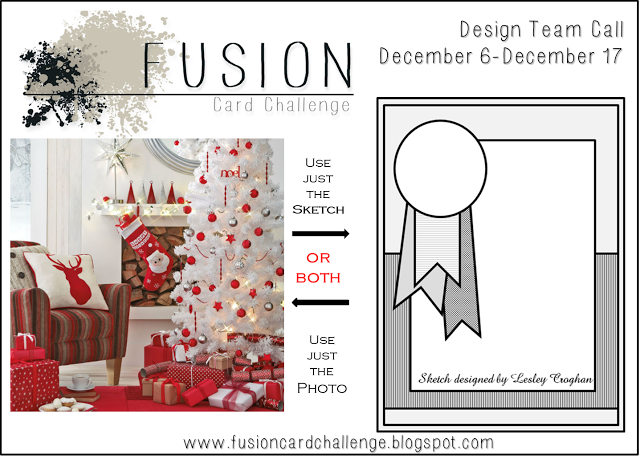 At the end, I ended up making two cards… which one is the nicer one, let me know! 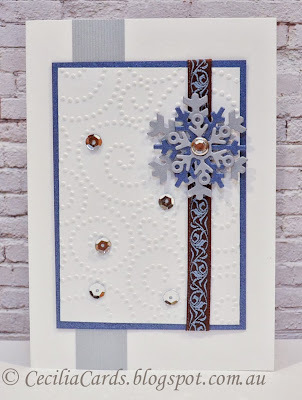 Neenah Solar White, Metallic card stock, Spellbinders Heirloom Ornament, Hero Arts Embossing Folder, Versamark, Silver EP, MFT DieNamics Let it Snowflake dies, Simon Says Stamp Snowflake die, AC Jewel brad, ribbon, MT Tape, stickles and sequins. Yay, all my Christmas shopping is done, but only some wrapped (the ones that are going out this week). The trees in our street have all been 'bowed'. Every year, two sections of our street are decorated with red bows on every tree. My neighbour down the road started this tradition a few years ago and he does his side of the street and I do our side. So when you drive down our street, two sections are lined with red bows! I managed to make a whole stack of cards last night, they are quick and easy to make. 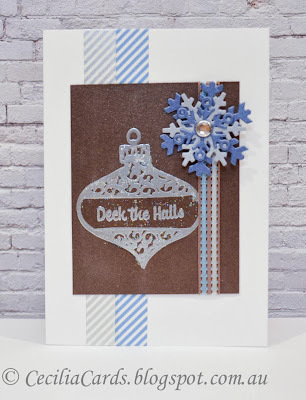 I decided to use the Simon Says Stamp Holiday kit and used the lovely patterned cards from the kit. Here are some of the cards I made. 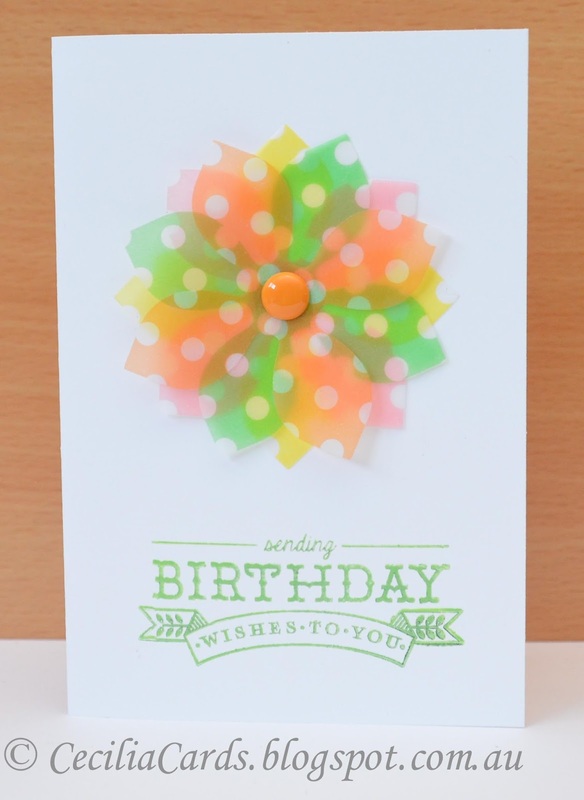 A clever use of the die cuts meant that I had two cards for every piece of patterned paper! 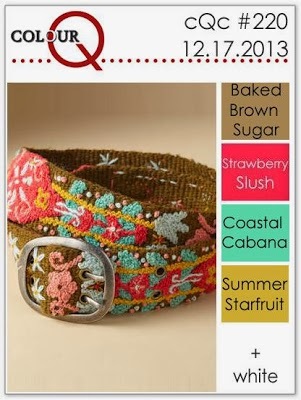 I love the Lil Inkers stitched squares and circles! 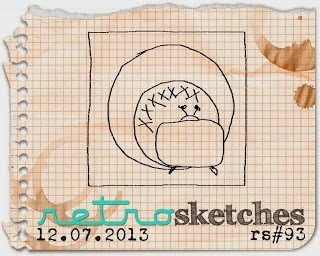 I'm adding this to Simon Says Stamp Wednesday Challenge - Stamp out 2013. 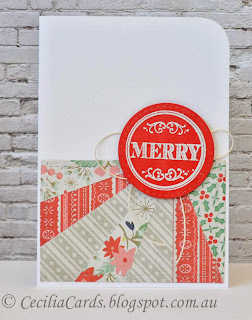 Neenah Solar White card, Simon Says Stamp Elegant Holiday Card Kit, Lil Inkers Stitched Squares and Stitched Circles Dies,Hero Arts Holiday Cheer Dies, MT Tape and star rhinestones. I don't believe it, we are nearly there! Half my Christmas shopping is done, and wrapped, Christmas tree is up. 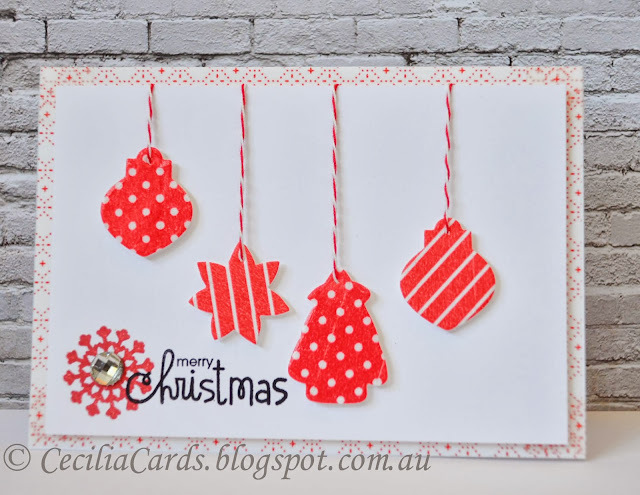 All my Christmas cards have been sent! 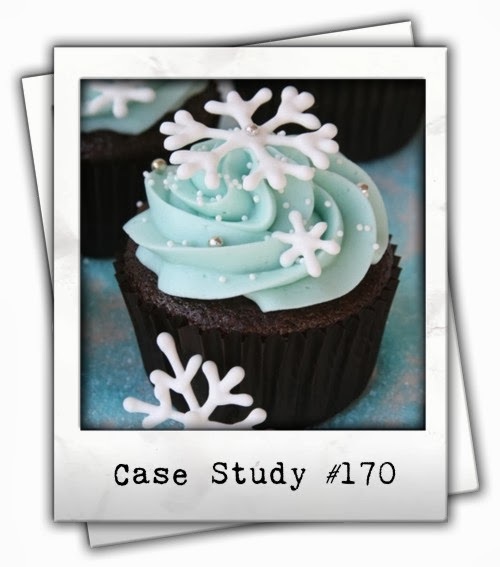 Now time to get on to some Christmas baking this week! 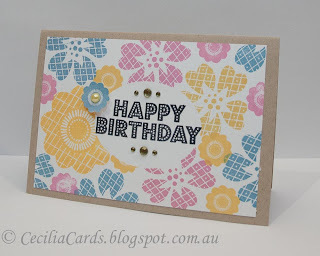 Here is a relatively quick card made with Washi tape and very little stamping. It was fun to put together! 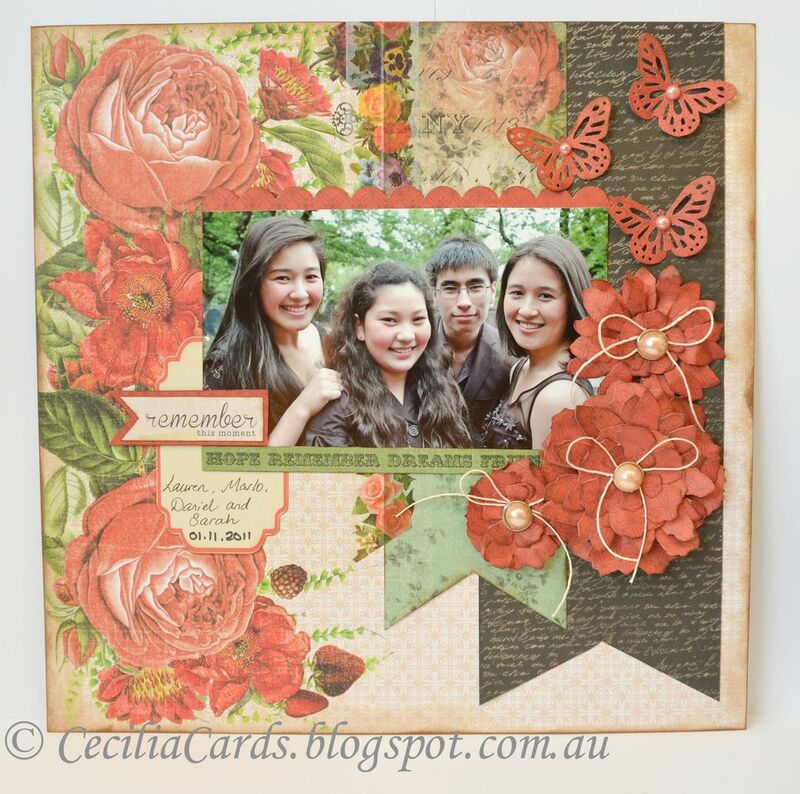 Neenah cardstock, Paper Smooches Merry Motifs, Hero Arts Red Royal, Ranger Archival Jet Black, twine, MT masking tape. 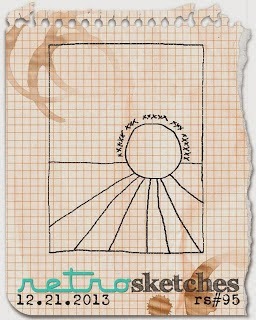 This is a late post today as I wanted to make this card today for Retro Sketches and PTI Make It Monday challenges. 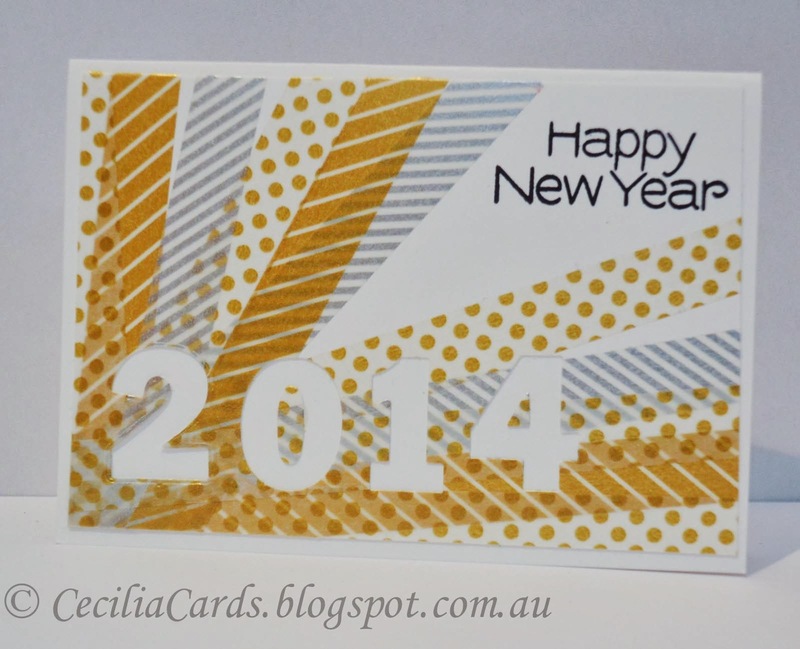 I've heat embossed on vellum with glitter embossing powder which I bought a few a years ago…. still unopened until today!! 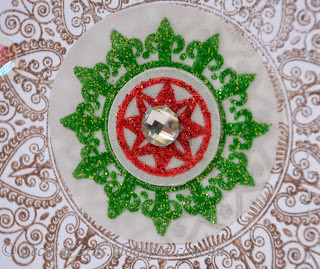 I love the glittery effect on the vellum! Thanks for dropping by! 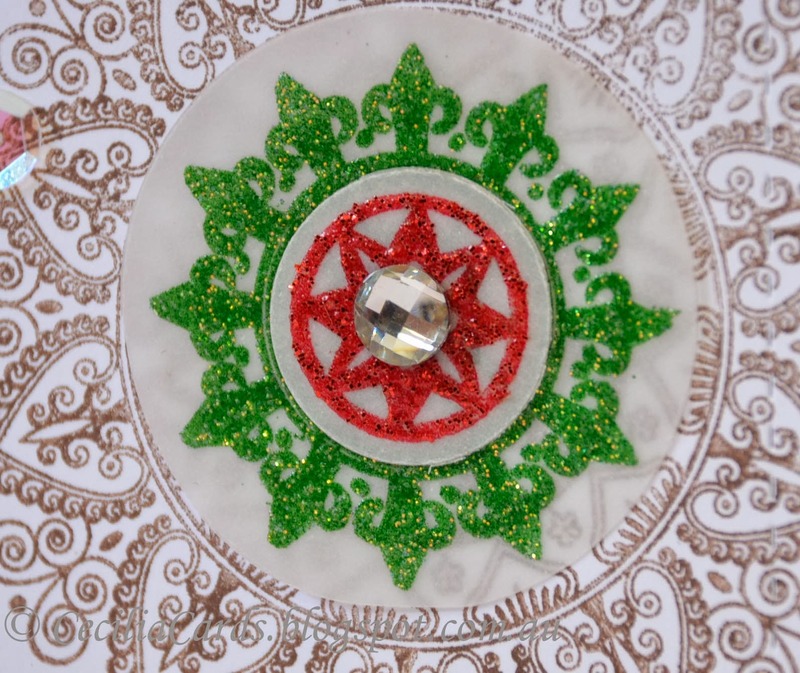 Close up of the embossing on vellum with clear dimensional tapes in between. Neenah cardstock, Lil Inkers Stitched Squares, Spellbinders Nestabilities Circles, heavy weight vellum, PTI Holiday Photo Finishers, Mega Mehndi Medallion, Think Big Favourites #20, Hero Art Cup O'Joe, Ranger Archival Jet Black, Versamark, glitter embossing powder, Hero arts gemstone and sequins from Lyndal. Hooray! Our Christmas cards are done! They will be all posted tomorrow! 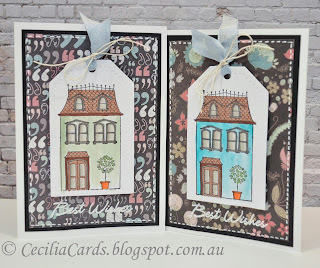 I had to make a few gift tags tonight for a couple of presents for the weekend. 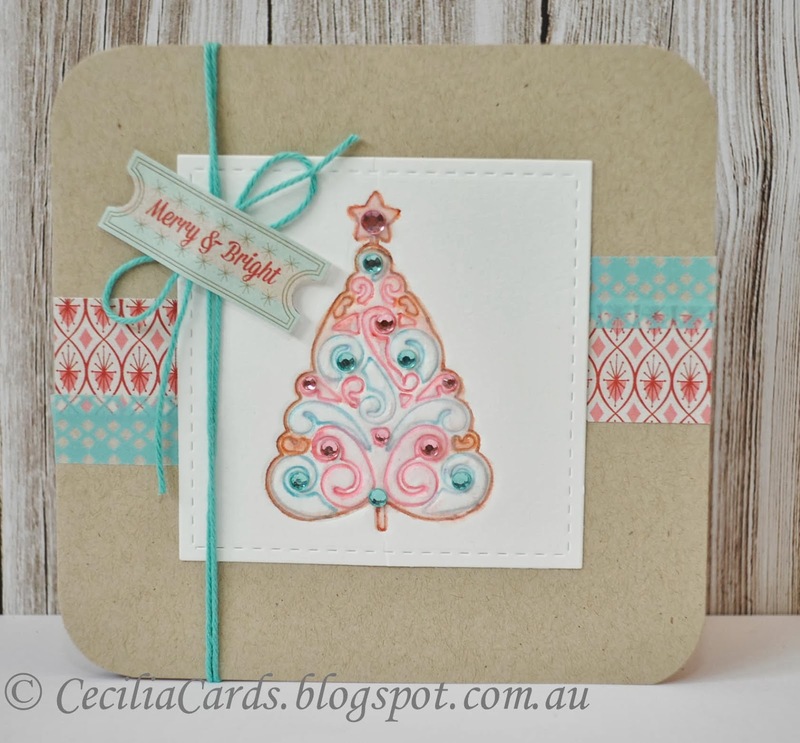 I decided to use my new Paper smooches die and the Merry Motifs stamps and die set. I combined them with a bit of Washi tape. As my blog followers know, I don't like to make the same design over and over. So I came up with three different tags. Here they are. TGIF the 13th! 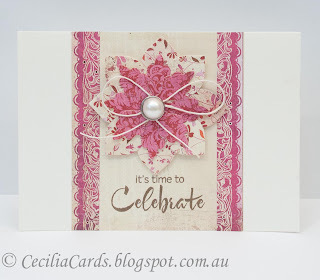 Another quick card today (just what we need right now) made with my favourite patterned paper of all time! 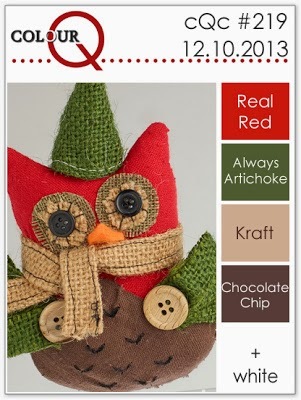 You guessed it - Basic Grey Aspen Frost. Not sure what I'll do when I run out! 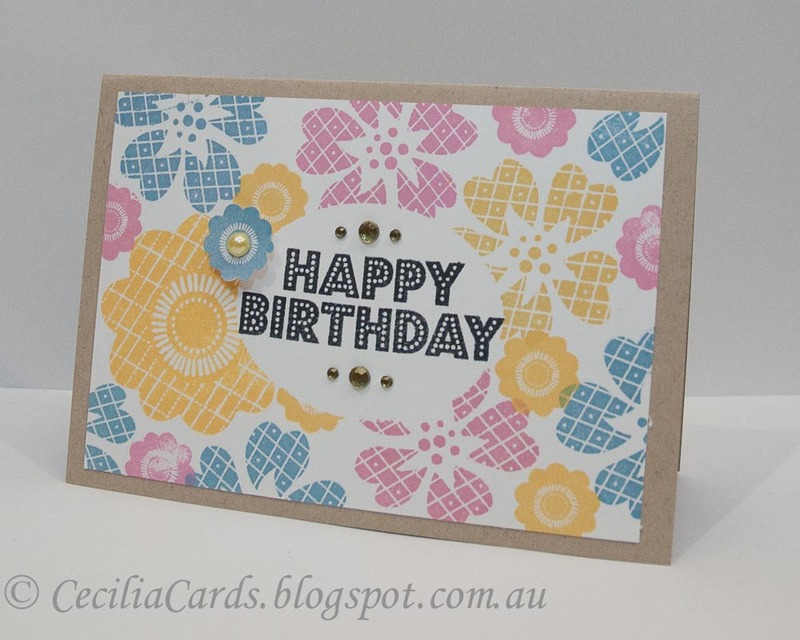 A quick and easy card made with no stamping! 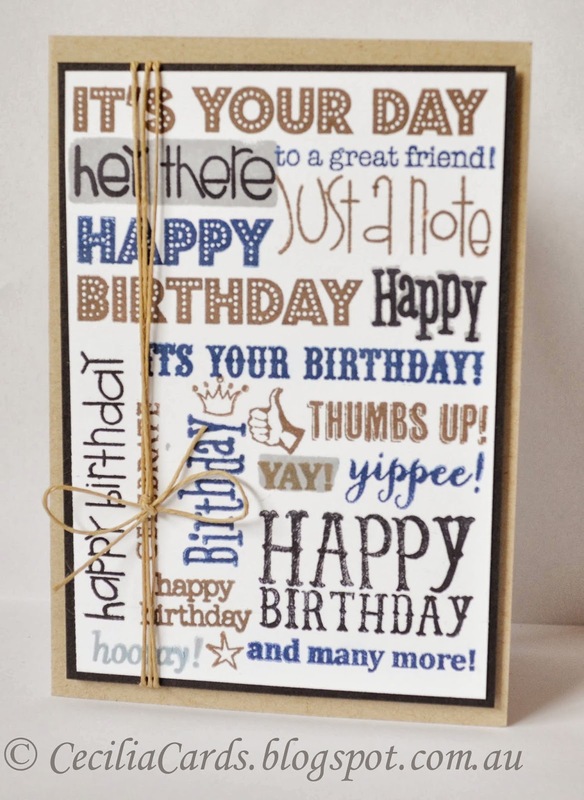 Thanks for dropping by… still need to get all my cards sent! 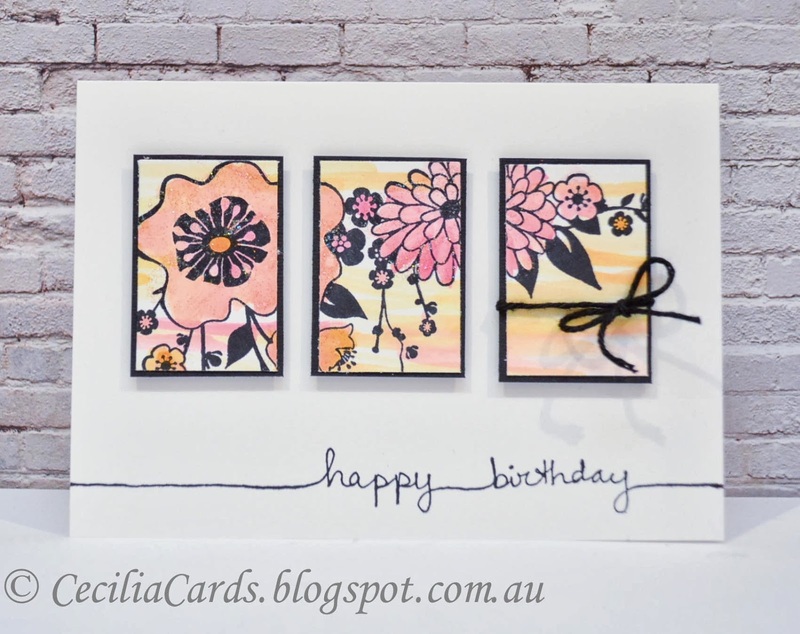 I've already received 3 lovely handmade cards! 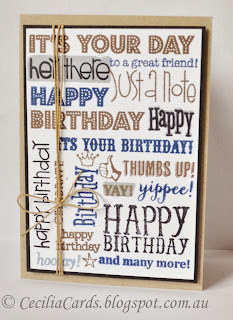 Thank you Lyndal, Michelle and Jenny! 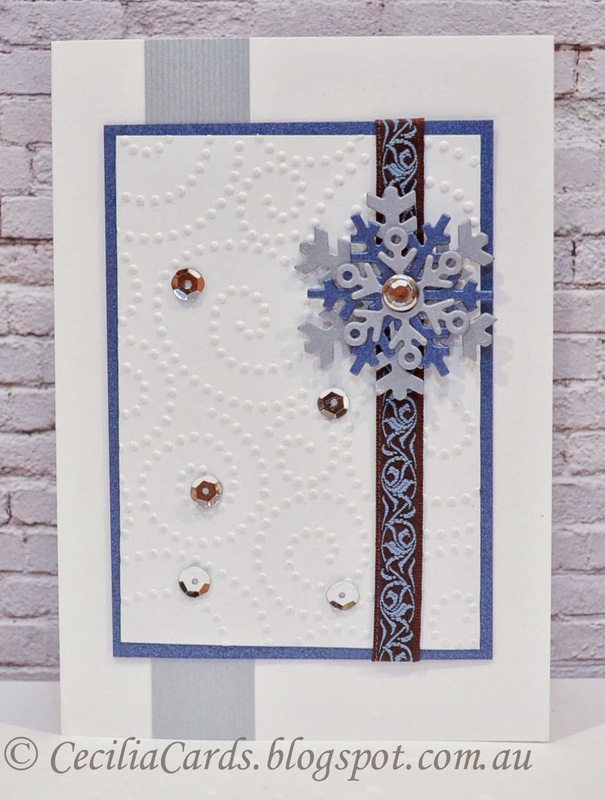 Neenah Solar White, Basic Grey Aspen Frost 6x6 and die cuts, sequins and Kaisercraft rhinestones.